It’s hard to believe that July is just around the corner. What the heck happened to June? I’m pretty sure that it was just May a few days ago, wasn’t it? To commemorate the onset of the seventh month, Las Vegas has decided to call in some record breaking temperatures. Today is predicted to be 115, Saturday 117 and both Sunday and Monday even higher. Ridiculous. We get it, Las Vegas. You’re in the desert, and you’re hot. You more than proved that at 112 degrees. Stop showing off. You can imagine what the top news stories have been like around here lately. Anchors remind you to “hydrate”, “stay indoors” and “be sure to get your air conditioner checked out if it’s old.” Pretty much the same thing on every channel. Uh, thanks for those nifty tips, gang. If a station really wanted to differentiate, they should throw something in like, “Now might be a good time to try that old fry-an-egg-on-the-sidewalk idea to see if it works!” You know, give the heat a “glass is half full” spin. 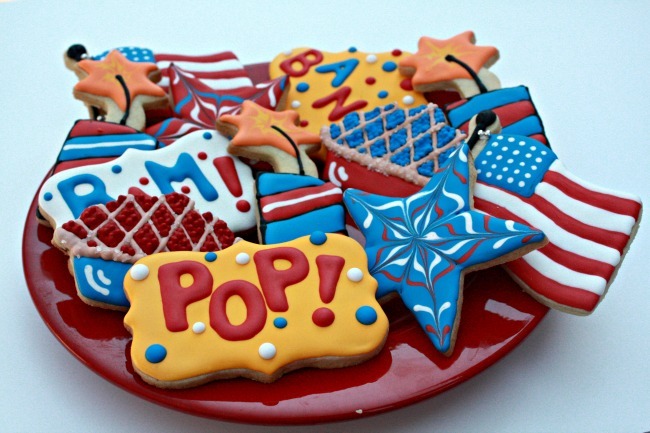 Or they could tell people to do what I do: Stay inside and decorate Fourth of July cookies. 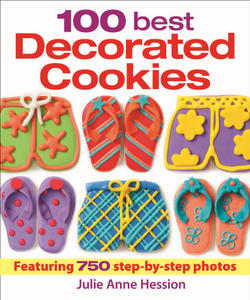 I was alerted by a friend this week that my second book, 100 Best Decorated Cookies, has shown up on Amazon for pre-order, which is really exciting. Now, as much as I adore decorating cookies, after I finished with this manuscript I needed a serious break from my piping bags and my disco dust. The process involved a massive amount of decorating, and my hands had been consistently stained with gel paste for 5 months straight (which looked so classy when we went out to dinner with friends.) It was the cookie decorating equivalent of eating an entire half-gallon of your favorite ice cream in one sitting. You still love it, you just need a bit of space for a minute or two. I don’t know if it was seeing my book on Amazon or the fact that I just got some really cute new cutters, but suddenly this week I had a renewed urge to decorate, so decorate I did. And it was fun. Still messy, but fun. 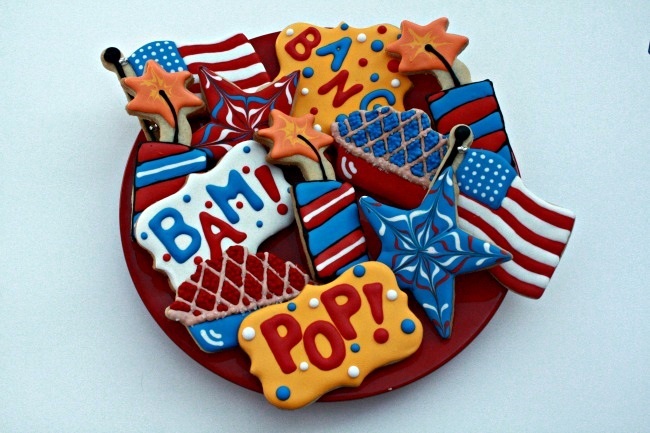 This has been my standard decorated sugar cookie recipe for years, ever since I created it for my Las Vegas bakery/cafe, Julie Anne's. The vanilla-orange flavor is reminiscent of a Creamsicle, one of my favorite childhood treats. This royal icing recipe is the one that I use for all decorated cookies. 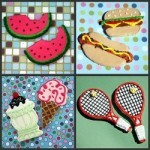 Both will be featured in my upcoming cookbook, "100 Best Decorated Cookies." In the bowl of an electric mixer fitted with a paddle attachment, beat sugar with butter on medium speed until light and fluffy, 3-4 minutes. Beat in the egg, yolk, orange zest and vanilla until well combined. With the mixer on low speed, gradually add the flour mixture to the bowl, mixing until combined. Transfer the dough to a work surface and divide into two equal pieces; form each piece into a flat disk. Wrap each disk tightly in plastic wrap and refrigerate for at least 1 hour or up to 3 days. Preheat the oven to 350F/180C, and place racks in upper and lower thirds positions. Line cookie sheets with parchment paper. 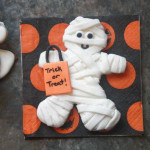 On a lightly floured work surface, roll out one piece of dough to a thickness of about 1/4-inch (.5 cm). 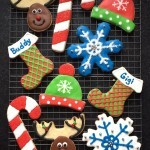 Use cookie cutters to cut out shapes and carefully transfer them to the prepared cookie sheets, spacing apart. Reroll scraps as necessary. Bake cookies for 11 to 15 minutes, switching positions of cookie sheets halfway through, until cookies are set and golden brown. Let cookies cool on sheets for 10 minutes then transfer to wire racks to cool completely before decorating. In the bowl of an electric mixer fitted with the whisk attachment, beat sugar and meringue powder on low speed until combined. Increase the mixer speed to medium and mix for 4 minutes, stopping to scrape down sides of the bowl as necessary. Increase the mixer speed to high and beat for 4 to 6 minutes more, or until icing has become stiff and glossy and the whisk attachment can stand up in the icing without sinking. Instead (or in addition) to using orange zest, I sometimes use a flavoring from King Arthur Flour called Fiori di Sicilia. It has a lovely creamsicle flavor. 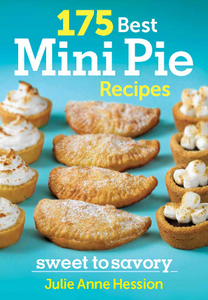 You only need a little bit -- about 1/2 tsp (2 mL.) If you want an even more lemony flavor, replace even more of the water with lemon juice. If you don't have a stand mixer for the icing, a handheld should work just fine -- it will just take a bit longer to reach the proper consistency. Wow, that’s hot. My brother is in Vegas this weekend. 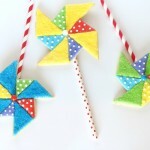 Love the bright colored cookies. They are fantastic looking! Those are awesome, Julie. Such a talent!